Silver Hill Farm is a fully integrated family owned duck company. Founded over 50 years ago by Ronnie and Lyla Steele in Emyvale, Co. Monaghan. All aspects of our duck production are owned and controlled by Silver Hill Farm from breeding, egg production, hatching and selection to processing and cooking. The success of Silver Hill Farm lies in the unique Silver Hill Hybrid duck. Continually developed over the years, to produce a duck that is full of flavour, succulent, tender and consistent in its quality. This breed is exclusive to Silver Hill Farm. 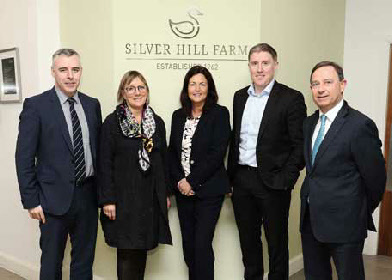 Last Monday March 5th, Silver Hill Farm welcomed Enterprise Ireland CEO Julie Sinnamon to Emyvale to discuss Silver Hill’s Plant Expansion plans with the rest of the Enterprise Ireland team. Over 55 years Silver Hill has built up their global sales on Chinese duck, processing some 80,000 of their unique cross-breeds every week for the Chinese restaurant trade. To meet increasing demand in export markets such as Singapore & Hong Kong, as well as opening up new Asian markets, Silver Hill are in discussions to increase capacity of their Production Operations. Micheál Briody, CEO of Silver Hill Farm stated “As a large employer in the North Monaghan area and a company that currently exports to 27 countries worldwide, Silver Hill owe a lot of that success to help received from Enterprise Ireland over many years”.